HONOLULU (Reuters) - A team of researchers trying to solve the mystery of aviator Amelia Earhart's 1937 disappearance said on Friday that underwater video from a Pacific island has revealed a field of man-made debris that could be remnants of her plane. The footage was collected in July by The International Group for Historic Aircraft Recovery (TIGHAR) during a $2.2 million expedition to Nikumaroro in the Republic of Kiribati. Unsolved questions about Earhart's fate have long heightened her legendary status as a pioneering aviator, and TIGHAR's voyage to seek clues in her disappearance gained interest far beyond the shores of the remote island where the team searched. The search was plagued by technical issues in what researchers described as challenging ocean conditions off the Nikumaroro reef, where they believe Earhart's plane landed and was then swept away into the sea. TIGHAR Director Ric Gillespie said that once his team experienced the harsh conditions, they knew they would not find a "nice intact airplane." He added the local environment is "very severe" because the ocean "tears things up and tries to bury" them. The TIGHAR team returned to Honolulu, which is 1,800 miles northeast of Nikumaroro, with no wreckage found. But the researchers said they took hours of underwater video, which they could not view while in Nikumaroro. TIGHAR said on Friday that one segment of the video shows a field of man-made debris that the group maintains could have come from Earhart's plane. Gillespie could not give a size of the man-made objects shown in the video, saying there was nothing in the images with which to compare them for scale. To the untrained eye, the photo supplied by TIGHAR does not appear to show any evidence of wreckage. But Gillespie said forensic imaging specialist Jeff Glickman of the firm Photek Inc identified the images as a debris field. "It's still very early days, but we have man-made objects in a debris field in the place where we'd expect to find it if our theory on the airplane is correct," Gillespie said. The TIGHAR announcement comes two days before a Sunday broadcast of a Discovery Channel special on TIGHAR's expedition. "We were rushing to get at least some video reviewed so we could show something (on Discovery)," Gillespie said. He added that his group has reviewed only 30 percent of the video they collected. "We don't want to oversell this. It's more evidence. It is where it should be, and that is encouraging," Gillespie said. "If it does appear to be airplane wreckage, it becomes figuring out how to go back and look at it." Earhart and her navigator, Fred Noonan, departed Papua New Guinea July 2, 1937, during Earhart's quest to circumnavigate the globe along an equatorial route. But they disappeared that day and emergency searches did not locate them. Hans Van Tilburg, coordinator of the maritime heritage program for the Pacific region of the National Oceanic and Atmospheric Administration, said making a discovery of a decades-old object in the Pacific Ocean is very difficult. "The Pacific Ocean is a high-energy environment and the aircraft they are looking for is quite fragile," he said. "Therefore finding something and making identification is very difficult. You are looking for broken pieces." It has been 72 years since famed aviator Amelia Earhart and navigator Fred Noonan disappeared while attempting to fly around the world. But the mystery remained unsolved: Nobody knew exactly what happened to Earhart or her plane. The 1937 disappearance of aviation pioneers is a mystery that continues to fascinate. Several drastically different hypothetical answers have been provided to the question: "What happened to Amelia Earhart?" for awhile, and died on Nikumaroro atoll in the Phoenix Islands. It now appears that at least some of these theories can be put to rest. 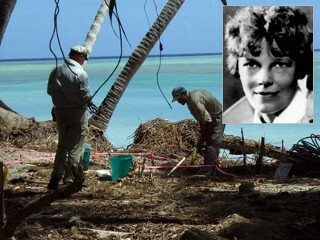 Researchers at the International Group for Historic Aircraft Recovery, or Tighar, say they are on the verge of evaluating DNA evidence that would demonstrate Earhart had been stranded on Nikumaroro Island (formerly known as Gardner Island) before finally perishing there. "Propagation analysis of nearly 200 radio signals heard for several days after the disappearance make it virtually indisputable that the airplane was on land," Tighar's Executive Director, Ric Gillespie, said. Eventually, Earhart's twin-engine plane, the Electra, was ripped apart by Nikumaroro's strong waves and swept out into deep water, leaving no visible trace. "The evidence is plentiful -- but not conclusive yet -- to support the hypothesis that Amelia landed and died on the island of Nikumaroro," forensic anthropologist Karen Ramey Burns told Discovery News. The author of a book on Earhart, Burns believes that the strongest of the amassed evidence comes from the report related to the partial skeleton found by a researcher named Gallagher. "The skeleton was found to be consistent in appearance with females of European descent in the United States today, and the stature was consistent with that of Amelia Earhart," said Burns. During a 2007 expedition to Nikumaroro, Gillespie and his crew uncovered early 20th-century makeup and two pieces of broken glass that match a 1930s compact mirror, among other artifacts. DNA can be extracted from such remnants as long as those artifacts aren't contaminated during the collection process. Unfortunately, in 2007, they were. Armed with a new collection protocol, Gillespie and his team hope newly discovered skeletal remains will provide the DNA samples for comparison. A woman directly related to Earhart, who wishes to remain anonymous, agreed to provide Gillespie's group with a reference sample of mitochondrial DNA. This type of genetic material differs from nuclear DNA in many ways, primarily because it's passed down the female line. Mitochondrial DNA, also referred to as mtDNA, is often used in forensics research. Because mtDNA is found in the cell's mitochondria, rather than the chromosomes of the cell's fragile nucleus, it isn't as quick to break down even when subject to difficult environmental conditions. According to Burns, another piece of documentary evidence comes from the accounts of Lt. John O. Lambrecht, a U.S. Naval aviator participating in the search for Earhart's plane. Lambrecht reported "signs of recent habitation" on what was officially (then) an uninhabited atoll. Lambrechet's report begs the question: Why did no one follow up? "I have stood in plain sight on Nikumaroro in a white shirt waving wildly as a helicopter flew over me and was not noticed until the video tape of the flight was examined," Burns said. "I find it very easy to believe that Amelia and Fred would not have been seen by the pilot. If the Electra was not visible at the time, their last chance of rescue was lost in Lambrecht's notes," she added. Abandoned on a desert island where temperatures often exceed 100 degrees, even in the shade, Earhart and Noonan likely eventually succumbed to any number of causes, including injury and infection, food poisoning from toxic fish, or simply dehydration. The coconut crabs' great pincers would have done the rest, likely removing some of the last physical traces of this pioneering aviatrix. [above:] Map shows location of the Nikumaroro atol. Australia is just visible on the left. The Hawaiian Islands are not visible because of the graphic overlay but are located in the upper right of the globe. This has to be one of the most remote places on planet Earth.